One of the impossibly small bears shimmying up a tree. Mama has returned. And once again, she’s given birth to three adorable cubs. They’re about the size of a cat and one is a major squaller. My husband was treated to seeing the squaller climb HIGH into a tree in back of our house. He refused to come down, so Mama went up after him and once he hit the ground, she picked him up in her mouth and hauled him off into the woods. Sometimes Mama comes to the house alone and sits on the back deck gazing in through our French doors. I know she’s just looking for food, but it’s hard not to imagine what she really wants is some peace and quiet. In honor of the return of Mama and her new brood, I wanted to share some bear myths and facts with you today. These are from the Get Bear Smart Society. Myth: A bear standing on its hind legs is about to charge. Fact: Actually, the bear is just trying to better identify what has caught its attention. It’s easier to see, hear and smell thing from a standing position, than down on all fours. Myth: Once a bear has tasted human food, it won’t eat wild food any more. Fact: Bears naturally prefer wild food unless it is difficult to find and human food is too easy to get. Even the worst food conditioned bears still eat natural foods whenever they’re plentiful. Myth: If a bear charges you, play dead or climb a tree. Fact: Black bears are excellent climbers. Their agility and claws allow them to quickly climb trees to escape danger. Playing dead may work, if you’re attacked by a bear who has identified you as a threat. Fact: Although classified in the order of carnivora, black bears are omnivores, eating both plants and animals. Only 10 to 15% of their diets consist of meat, including fish, insects and mammals. Myth: One of the most dangerous encounters is getting between a mother black bear and her cubs. Fact: Because black bears can tree their cubs, it is rare for them to attack a person in defense of cubs. 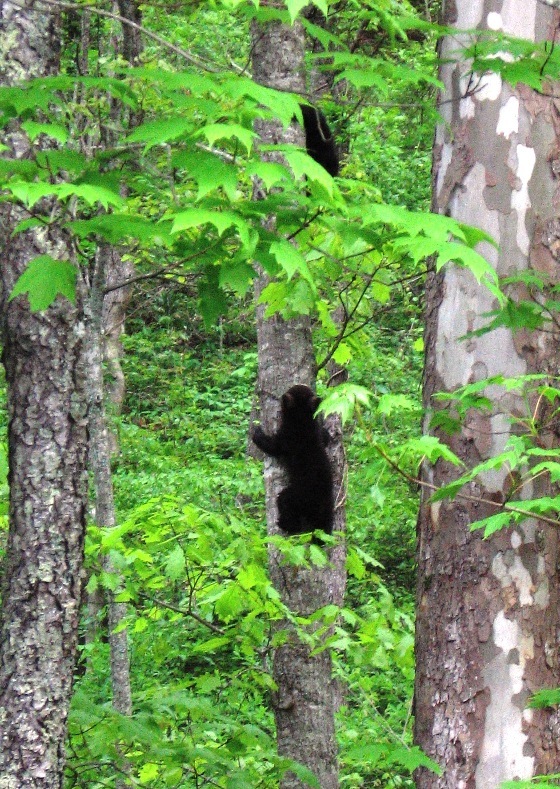 Black bear cubs are great at climbing and will be sent up a tree if the mother bear feels nervous about a situation. If you see a mother bear and cubs give them some space, be quiet and retreat slowly.